To have a grip that is maintained consistently through a series of shots. Without consistency, shot placement may become erratic and the ability to call the shot will be limited. Generally pistols purchased have anatomically designed grips that fit the contours of the hand. But minor alterations may need to be done so that each time the pistol is gripped and raise to the target, the sights are perfectly aligned. It is most important that the pistol sights are aligned when they are pointed to the target as altering the wrist to compensate this alignment will lead to bad shot placement, improper follow through and possibly a loss of confidence in the pistol. Using a blank wall for an aiming area, assume your stance as discussed previously. Place the pistol in the shooting hand and have the arm about 45 degrees as if you are preparing for the start of a timed fire series. Look at an area on the wall and close your eyes. Raise the pistol to where you think it may be aligned to this area as if you have a target in front of you. Open your eyes and look at the sights and see if the sights are aligned. Pay little attention at this stage to the whereabouts the pistol is on the “area” on the blank wall. We are only interested in the sight alignment. At this stage we are more concerned with left and right alignment. If the sights are aligned, try this exercise again to check the alignment to see if this can be achieved each time the pistol is raised. If the sights are not aligned (left or right) hold the pistol with the non shooting hand and loosen the grip slightly. Gently rotate the pistol in the hand to the direction which will allow the sights to become aligned. Lower the arm and again close the eyes and raise the pistol and open the eyes. Are they aligned now? Re-test this several times. Having the sights aligned now, you may notice the grip has become “uncomfortable” and feels like there are hollow sections where the skin does not make contact with the grip. At this stage we need to “fill in the gaps”. Take a mental note of the areas that need filling. It may also need the removal of wood such as sharp edges so that the hand attains the same grip each time. Just remove wood slowly with a file or Dremel tool. Take out small amounts and re-test often. Filling the gaps takes some time but if you don’t succeed with the desired result the first time is it very easy to “pop” off the filler and start again. You need to purchase some filler which dries fast (within 3-5 minutes). I personally use Plasti-Bond but car body filler will also do the job just as good. Care must be taken as the filler will ad to the weight of the pistol depending on the amount used. You will also need some cling wrap to cover the filler as it sets. Firstly having made a mental note of the gaps to be filled, mark them on the grip and judge the thickness you need to fill. Mix the 2 part filler as per the directions and place the required amount on the areas need to fill. Place the cling wrap over the grip and place the hand into the grip “gently”. At this stage the filler is still very soft and care needs to be taken as not to grasp the grip too hard so that the filler squeezes out all over the pistol. Hold the pistol by the barrel with the non gripping hand taking all of the weight. After about 2-3 minutes the filler starts to set and becomes warm. Remove the hand and the cling wrap. With a scalpel remove any sharp edges from the “squeezed” out filler. This has now formed an exact mould of your hand. Assume stance and try the alignment test as before. This may take several attempts but if it does not work the first time, simply use a small screwdriver and lever the filler off the grip. Altering grips can be time consuming and in some instances “disastrous”. People have been known to start out with a “not too bad grip” and ended up with a “broom” handle for a pistol grip. Below are diagrams which may help you achieve the proper sight alignment you require. 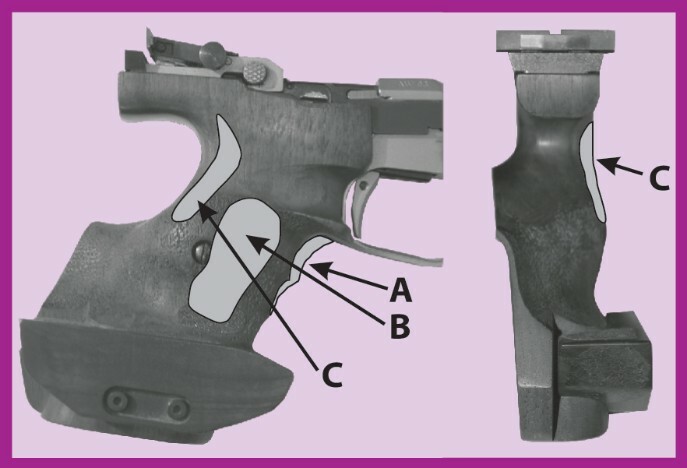 To make the pistol point right, remove from point “C”. To make the pistol point left, add into point “B”. To raise the front sight, add into point “A” and conversely to lower front sight, remove from point “A”.